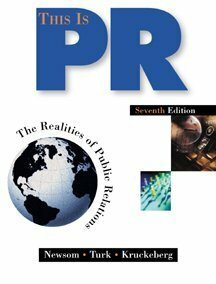 This volume introduces students to the world of public relations with a strong emphasis on the fundamentals, such as history and research, as well as the emerging issues, such as technology, ethics, and the international aspects of public relations. Communication, Southwest Education Council for Journalism and Mass Communication, Texas Public Relations Association, and both the Dallas and Fort Worth chapters of PRSA. Dr. Newsom has been national faculty advisor to PRSSA. She has been head of the PR Division of AEJMC and served as chair of its former division heads. Awards include the Institute for Public Relations' Pathfinder, PRSA Outstanding Educator, Public Relations Foundation of Texas's Educator of the Year Award, Texas Public Relations Association's Golden Spur, the Association for Women in Communications Headliner, and in 2010 she was named to the Hall of Excellence of TCU's Schieffer School of Journalism. She has served Fulbright teaching appointments in India and Singapore; given workshops in South Africa, Hungary, Bulgaria, Poland and Vanuatu; and taught in Latvia and England. She has been chair of the Fulbright discipline committee, served 18 years on a gas research institute's advisory council and was one of the first women elected to the board of a publicly held company, she was the first woman elected to the board of ONEOK where she served 24 years until reaching mandatory retirement age. Currently, her volunteer public relations work is for Rotary International. Dr. Dean Kruckeberg, APR, Fellow PRSA, is a tenured full professor in the Department of Communication Studies at the University of North Carolina at Charlotte.Dr. Katerina Tsetsura (2004, Ph.D. in Communication, Purdue U) is an assistant professor in the Gaylord College of Journalism and Mass Communication at the University of Oklahoma.